Toronto is reviewing its ward boundaries. See the options presented on the Draw the Lines site and complete a survey. Come and learn from the experts, be inspired by the innovators working in neighbourhoods across the GTA, and meet others interested in maintaining vibrant main streets. Come talk popups, small business, placemaking, and all the factors that contribute to a strong community. Toronto Chief Planner Jennifer Keesmaat is the keynote speaker at this one day symposium and there will also be a speaker from Street Sense who developed the Vibrant Streets Toolkit for Washington, DC and has since created a national toolkit. See here for more information, including registration information. Brought to you by WoodGreen and DECA. This entry was posted in Event on October 29, 2015 by The Ashbridge's neighbourhood. Today October 22 at East End Community Health Centre, 1619 Queen Street East. RSVP to 416-778-5858 ext. 223 – Matthew. 6:45 25th anniversary celebration – food and refreshments will be served. See the East End CHC site. This entry was posted in Event, Queen Street on October 22, 2015 by The Ashbridge's neighbourhood. Are you new to family or local history? Would you like to discover the many resources and services available to you from the Archives of Ontario? Danielle Manning has worked at the Archives of Ontario for over two years, first as an archivist and now as an Outreach Officer. Danielle will introduce us to some of the great key resources available to genealogists and local historians at the A.O. 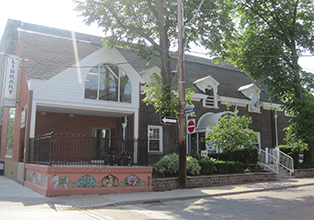 This entry was posted in Ashbridge neighbourhood history, Ashdale Village / Little India, Gerrard Street East, Event, Gerrard-Ashdale Library on October 15, 2015 by The Ashbridge's neighbourhood. Meet the Ashbridges: The people, history and the archaeology of the Ashbridge Estate. 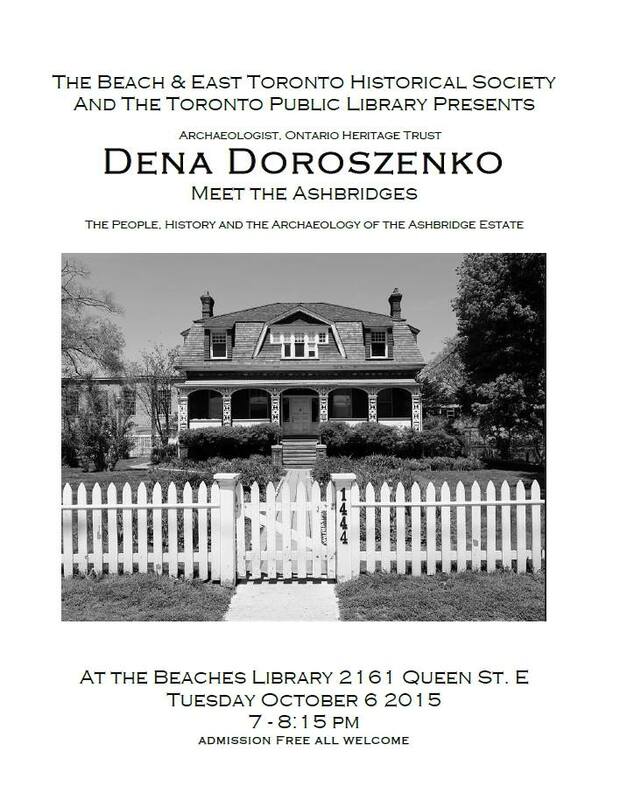 Dena Doroszenko conducted archaeological research at the Ashbridge Estate. She is an expert on the Ashbridge Estate and the Ashbridge family. As part of Duke of Connaught School’s 100th birthday celebrations in 2012, Dena spoke at Duke, invited by Susan Fletcher of Applegrove Community Complex. This entry was posted in Ashbridge Estate, Ashbridge neighbourhood history, Beach / Beaches, Event on October 5, 2015 by The Ashbridge's neighbourhood. Thursday October 8, 7 p.m. at S.H. Armstrong, 56 Woodfield Road. 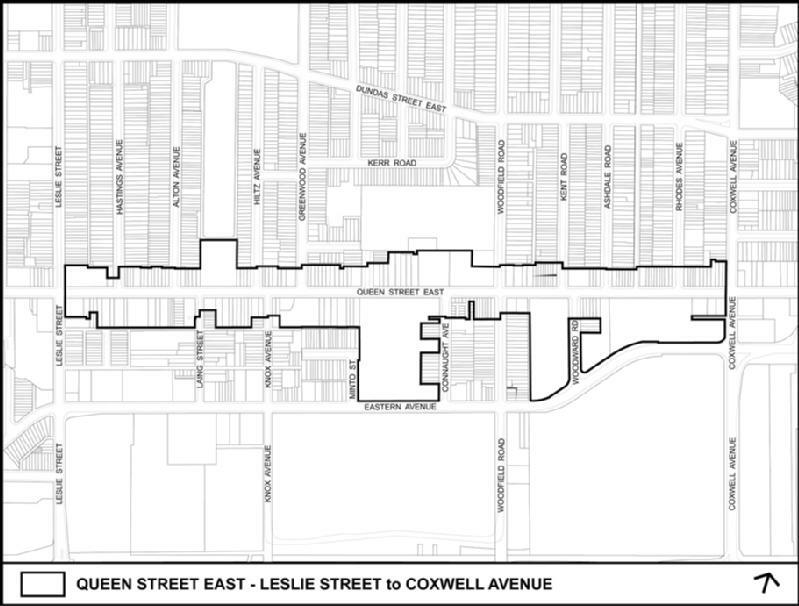 City Planning is undertaking a study of Queen Street East between Leslie Street and Coxwell Avenue. Specifically, City Council has requested that the City Planning Division determine if either the existing Urban Design Guidelines for Queen Street East or the Leslieville Urban Design Guidelines should be extended to apply to the portion of Queen Street East between Leslie Street and Coxwell Avenue. The City held the first meeting for this Study on April 21, 2015. Please join us at the next Community Meeting where we will present the draft urban design guidelines, which reflect the community feedback and the Official Plan policies for Queen Street between Coxwell Avenue and Leslie Street. You may also contact Councillor Paula Fletcher, Ward 30, at (416) 392-4060 or Councillor Mary-Margaret McMahon, Ward 32, at 416-392-1376. Personal information received at community consultation meetings / workshops or contained in correspondence with the City is collected under sections 8 and 136 of the City of Toronto Act, 2006 specifically for creating a public record of information potentially relevant to making an informed decision. Questions about the collection of this information may be directed to the email address listed above. Compliance with City Council policy respecting Notice may result in you receiving duplicate notices. Attendant Care Services can be made available with some advance notice. See the city’s web page for this plan. See the meeting notice (PDF). This entry was posted in Event, Queen Street, S.H. Armstrong Community Recreation Centre on October 1, 2015 by The Ashbridge's neighbourhood.